Largest Dry Marker Board! This dry erase marker board is 5'H and available in four (4) widths. It is large enough to accommodate younger users or meet ADA requirements. 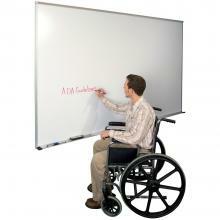 This Marker Board is constructed of durable porcelain enameled steel (50 year guarantee). A full length tackable maprail is included, along with a full length dry marker accessory tray, trimmed in rubber endcaps to protect you and your students.